This Men’s Genuine Leather Vintage Smartphone Waist Belt Pack Travel allows you to travel in style by using. It features a roomy exterior compartment that comes with a flap and a hasp closure system. The back comes with a wide loop that you can use to thread the detachable shoulder strap through and attach to your belt. The zippered top comes with leather pulls that make it easy to open. The bag’s interior offers plenty of room to store your smartphone, wallet and other essentials. 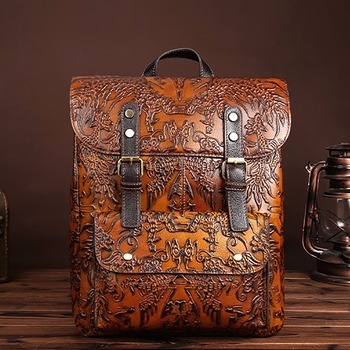 It comes in two shades of brown and has a distressed look that gives it its vintage style.